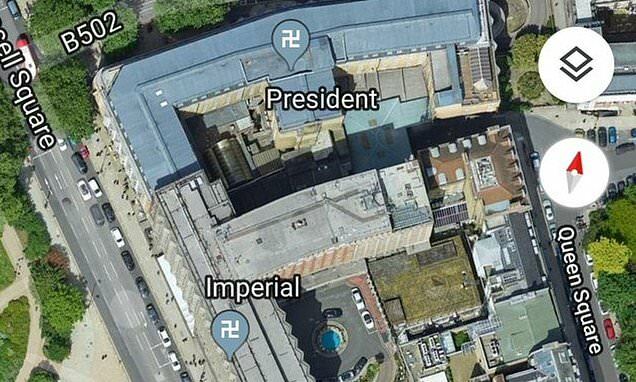 A bizarre bug has hit Google Maps that has made swastikas appear at locations around the world. The issue seems to be primarily affecting the Google Maps icons for hotels in Europe. Reports of the bug began surfacing on Friday when users submitted complaints to Google via Twitter. 'I opened my maps and was looking for hotels in the surrounding area, when I noticed the swastikas,' a woman named Katie from Dublin, Ireland, told HuffPost. 'I thought it was very strange so I took a screenshot. That's when I tweeted Google maps questioning it. 'I've since closed the app and reopened it and it's back to normal with the bed. This is the only time I've ever noticed it,' she added. Users outside Europe also encountered the bizarre bug. 'Hey @sheratonhotels and @googlemaps I'm in San Juan, Puerto Rico,' one user tweeted. The woman from Dublin shared what the bug looked like in a series of accompanying tweets.